A bit off topic....but it's raining outside. It was raining outside, so I was in need of an indoor project for the day. My parents' 50th wedding anniversary is coming up, so I decided to re-do my mom's veil with new tule as it had yellowed badly over the years. $2 and one hour later, it's like new! She will be pleased. Now, if I could just get those wrinkles out of her dress. That is a challenge with frail fabric. I bet you find a way to do that too .She will be so proud of her veil.You did a great job. Just beautiful PL, you did a superb job. First wrinkle cure that comes to mind is using a fabric softener sheet to iron thru on the wrong side of the fabric. Second has something to do with vinegar but I can't remember exactly what and how. Contact a vintage fabric/quilt restorer for info that might help. Contact a local quilt guild. Such a nice thing to do for your mother. She'll be ever so pleased, I'm sure. Happy anniversary to them. Being married for so long is something of a rarity these days. Your mums bridal viel looks terrific and what a lovely thing to do for her. I hope you manage to get the creases out of her wedding dress. I'd advocate taking it to an expert as the fabric is so old and delicate. Wish your parents a happy Golden Wedding Anniversary from me when the time comes. 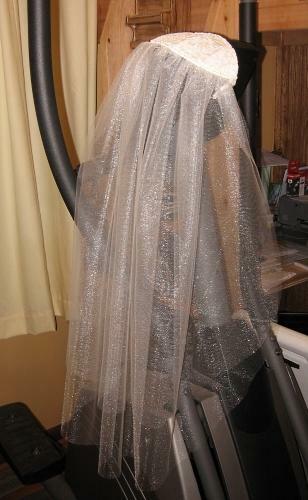 PL, you did an outstanding job on the veil. Your mom will be so pleased and surprised. Please wish them a Happy 50th for me!